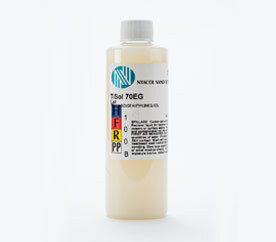 NYACOL® offers colloidal TiO2 as a transparent sol in water and EG. The sol is primarily anatase in crystalline form and is high in purity. The particle size is 10-15 nm by DLS. 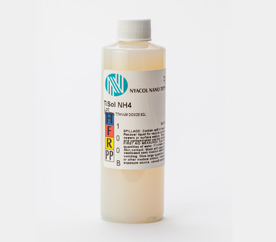 Designed for use in coatings and catalyst applications. Provides a high index of refraction for coating and excellent transparency as a result of the small particle size. Can be used as a transparent UV absorber. Developed as an inorganic alternative to organic type UV blockers. 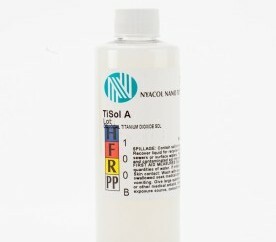 TiO2 particles dispersed in ethylene glycol, the product is transparent but still UV absorbing as a result of the small, highly dispersed composition. Product is intended to be added in PET synthesis and is supplied in fiber grade EG.